JAAS Systems will be conducting a JAAS Advanced Manufacturing Software (JAMS) for Acumatica training class the week of June 5-9, 2017. The JAMS class will provide our VARs an opportunity to understand the markets where JAMS for Acumatica fits best, while also learning to implement the system through a combination of classroom discussion and hands-on exercises. The week will be separated into two sessions. The first 3 days will concentrate on the manufacturing market and the 3 core modules that make up the Acumatica Manufacturing Suite; Bill of Material (BOM)/Routing, Production Management, and Material Requirements Planning (MRP). The final 2 days will concentrate on the newest modules of JAMS for Acumatica; Product Configurator, Estimating, and Advanced Planning & Scheduling. For further details please email Merrilee Schlemmer, mschlemmer@jaas.net, or phone her at 614.918.7054 as soon as possible. We look forward to seeing you during the week of June 5. Columbus, OH, March 31, 2017 – JAAS Systems is pleased to announce a partnership between itself, Acumatica and CADTalk to provide the Acumatica community with a CAD interface. CADTalk for Acumatica is a CAD integration tool that eliminates the manual transfer of data from CAD software into Acumatica by interfacing with JAAS Advanced Manufacturing Software (JAMS). This eliminates redundancy, cuts lead to production time, and reduces Bill of Material (BOM) errors. CADTalk allows for the creation of additional items and full BOM information, and allows users to update, revise, or manipulate existing information. CADTalk has provided world-class CAD to ERP integration and implementation since 2005, with customers throughout the world. With its deep understanding of ERP and the challenges facing engineer-to-order manufacturing companies, CADTalk can provide deep and robust integrations that can be configured for the customer’s needs. CADTalk has partnerships with all the major CAD/PDM vendors. Acumatica is a leading provider of cloud business management software that empowers small and midsize businesses to unlock their potential and drive growth. Built on the world’s best cloud and mobile technology and a unique customer-centric licensing model, Acumatica delivers a suite of fully-integrated applications, powered by a robust and flexible platform. Acumatica is designed for businesses looking for modern enterprise software powered by the cloud. Now with an interface that is tablet-friendly and optimized for mobile devices; Acumatica allows you to truly work from anywhere, using your choice of device, from a PC or Mac to an iPad or any other device with a browser. JAAS Systems specializes in software solutions for manufacturing companies. The JAAS team has over 200 years of combined experience in the manufacturing industry with a strong blend of business, financial, operational, technological and consulting expertise. Using our extensive background in manufacturing and business software solutions, we created JAAS Advanced Manufacturing Software (JAMS), a powerful manufacturing solution that delivers real-time information with a lower cost of ownership. 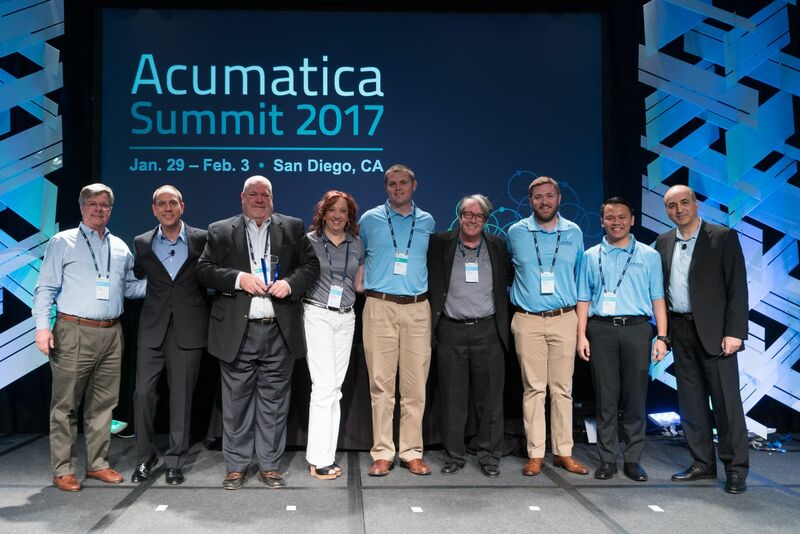 Columbus, OH, February 6, 2017 – JAAS Systems was pleased to attend and once again participate in the Acumatica Summit in San Diego last week. We were a Gold Sponsor for the event and involved in numerous sessions during the Summit as well as conducting a JAMS for Acumatica Training Class. JAAS Systems was recognized as the 2016 Acumatica ISV Partner of the Year. This marks consecutive years for JAAS Systems to be named ISV Partner of the Year. John Schlemmer, Chief Operating Officer, and Brendan Hennelly, Director of Development, were named Acumatica Most Valuable Professionals. This is John’s second MVP Award and Brendan’s first. Acumatica Summit is a yearly event bringing together the entire Acumatica eco-system; Value Added Resellers (VAR), Independent Software Vendors (ISV), and customers. It provides an opportunity to share ideas and discover what is new in the cloud ERP world; as well as training sessions. Columbus, OH – January 25, 2016 – JAAS Systems is pleased to announce organizational changes to better support the domestic sales and implementation of its manufacturing software. Christopher Long has become Director of Client Satisfaction for all North American customers; Acumatica and Microsoft Dynamics SL. Chris has been with JAAS Systems since autumn 2015 as Sr. Account Executive. As our customer base has grown over the years, it is imperative to have someone dedicated to that group; and Chris’ strong background in manufacturing and distribution makes him the ideal person to work with the customer base. We are pleased to welcome Thomas Van Cleef as Director, North America Acumatica Channel. Tom will be working with our North American Acumatica VARs as well as promoting Acumatica and JAAS Advanced Manufacturing Software (JAMS) to direct customers. Tom has over 30 years of experience in the manufacturing and distribution arenas with both direct and indirect sales channels. We feel these changes will enhance our capability of serving our current and future customers in the best way possible.